A rainy afternoon meant we needed a fun indoor project so I set up this spelling game and literacy activity for Kiddo at the table. My son loves to spell (at Thanksgiving dinner I cracked up when he clarified a misunderstanding, “No Grandma, food, F-O-O-D!”). He even takes over the living room with his spelling! I created this seek and find word game I like to call “Sift ‘n’ Spell.” It can easily be altered according to your child’s skill level (see tips at the end). Small bucket. A shallow, rectangular plastic food container is perfect. Letters. We have these small plastic letters, but you can make your own by writing letters on small pieces of cardboard, or use letter magnets. Toys or other small objects. First I set out a the bucket of rice with small letters hidden inside. (I always use something that I have failed to cook before the expiration date, failed housewife that I am. If you don’t want to use food, try clean sandbox sand from the hardware store.) I lined up a few toys with 3-4 letter names, such as “cat”, “bell”, “fish” and so forth. You want to make sure that the hidden letters will indeed spell the names of the objects! I happened to have some little colored plastic letters I got a long time ago at the craft store, but no need to buy anything, you could write the letters on small pieces of heavy paper or cardboard to hide in the rice. Using a slotted spoon, he sifted the rice to find the letters. He spelled all the words without any help from me! 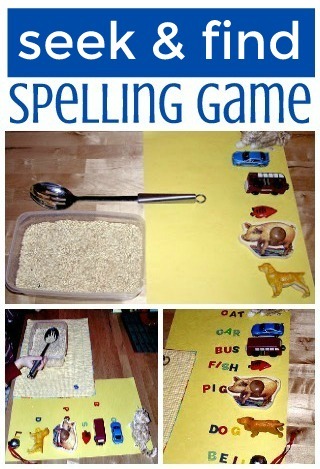 He loved this so much that when he was done he pushed the letters back in the rice and repeated the activity. For beginning readers write out the words so they can match each letter, placing them on top of the written word. For kids just learning the alphabet, match letters to a written alphabet. Or work just on the initial letter and sound of each word. If sorting letters into multiple words is too challenging, hide the letters to one words at a time. If your child can’t figure out where he should add his letter, sound out the words with him. Once all the letters have been found and the words spelled, be sure to review the words. MORE: Literacy activities at home don’t have to be complicated. See all my favorite ways for (Almost) Effortless Literacy Ideas for Kids. NEW: See aly in va’s comment below for a great toddler variation for this activity! Neat activity. Thinking for even a young kiddie (my 19 month old) I could hide matching pictures of the object ( pic. of pig & plastic of pig) to see if she could match those up. Thanks for the inspiration! That's a great variation! I'm adding it to the post! What a neat idea! Kiddo did really well and clearly had fun! What a fantastic idea! I must try it with my kiddos! Great idea. What a fun way to practice spelling! You could also use letter tiles from a game you probably already have – Scrabble, Boggle, Bananagrams… of course they are not letter-shaped, but I'm not sure that makes a difference.